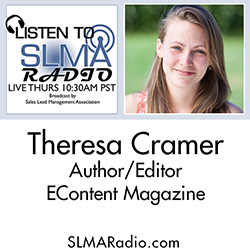 We interview Theresa Cramer, the author of EContent Magazine and discuss the definition of “Content Marketing” and why she wrote the 169 page book. We discuss why so many people admit believing in it and yet why a much smaller number are actually good at it. She will discuss why content marketing works better than traditional advertising and why journalists seem to be better at it than traditional marketers. We expect to discuss the percentage of budget dollars that are devoted to content marketing. The host is Jim Obermayer.